As Father’s Day approaches, there will be a ton of emphasis on fathers. But what about your father’s father? The one called grandpa or another affectionate term, is probably what he might be called, such as Gramps, Pop, Poppy, Pop Pop or any number of other endearments. John Burningham, in a series of softly sketched moments of give and take dialogue between a young girl and her “Granpa”, will endear this duo in your heart for some time to come. Their stream of consciousness back and forth is human, honest and humorous, all at once. It’s the sharing and acceptance of who they both are on a very real level that gets to you. And I think it will resonate with the adult reader, maybe sometimes at odd moments, even more than the one they are reading to. And that’s great, too! Here’s a sample of the gentle and, at times, unfiltered give and take between the generations. Not so nice is first. Picture: Both the older and younger generations in a back to each other stance. And the cycle of life comes to each as the give and take fades and Grandpa is confined to his chair. And the final page is simple, sad, yet oddly undramatic nor morose in the least, as the young girl sits in her chair, thinking about Granpa’s empty one. It is a real and true moment. For sharing life….and death is what the generations are bound to do with, and for, one another. 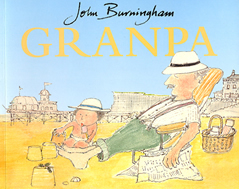 But it is everything that comes in-between those two events that John Burningham’s generations live to the full. And this simple, profound picture book reminds readers, in its way, to try and do the same. For that is what truly matters; the moments in life shared with the ones you love; the young and the not so young.